Blurring images is low pass filtering images. An artist’s blunted sight can have the same effects. Sometimes you need to get rid of distracting details in order to get the whole picture. Jay Clause‘s what Salvador Dali taught me about creative work will help you to (perhaps) get the whole picture. However, keep in mind that artists like to play with what the beholders of their work might want (or might not want) to percieve. 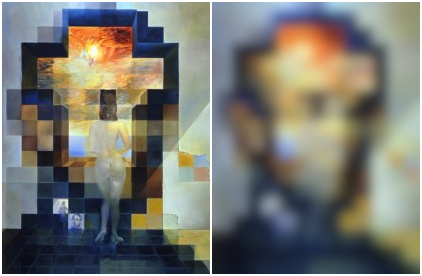 Even without blurring, artists can deny anything you “see” in an ambiguous creation: They play with their own pareidolia as well as with the pareidolia of their audience. Squinting might help you to see things which you wouldn’t see with clear sight. It’s fine to try that with artwork which has been intentionally created for such an exercise. But better make sure that it was an artist who created the face that is looking at you. I don’t know whether Mars ever has been inhabited by artists.